Even as it was unfolding, Tommy James knew he had a heck of a story to tell. The intimidating visitors, angry phone calls, mysterious disappearances. Little of it was directed at him, but James knew that could change in an instant if his hits dried up. James knew the stories were too good to keep, but he realized he needed to stay quiet and let time pass before he shared them. Nearly 40 years later, when James could finally paint the picture, he grasped he wasn’t even the star of his own tale. 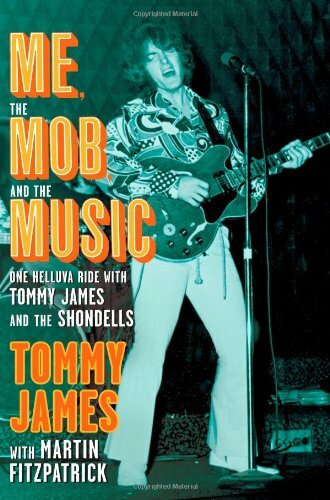 In his new memoir “Me, the Mob, and the Music: One Helluva Ride with Tommy James and the Shondells,” James recalls his tumultuous, dangerous relationship with Levy, a mafia associate who ran Roulette Records as a mob front. Morris had the business sense to know a sure thing, and the goons to make sure he got what he wanted. And at that moment he wanted James. Although he was intimidated by Morris, the two men eventually became good friends. Afraid for his live, James started carrying a gun and staying away from the Roulette offices, fearing retribution from Levy’s partners or, worse yet, becoming a casualty in the mob wars. Yet at the same time, he never refused a weekend invitation to get away with Levy on his upstate New York farm. “Every time I go to say something nasty about Morris or Roulette, I know there probably wouldn’t have been a Tommy James without them. I always keep that in the back of my mind. James left Roulette in 1974 and used what Levy taught him to set up his own label in the late ‘80s, about the same time the government finally caught up with Levy. Sentenced to 10 years for racketeering and extortion, Levy died from colon cancer before serving a day. In 2005, the last of the Roulette Regulars, as Levy’s partners were known, died, clearing the way for the book. Once again, Levy has already beaten James to the punch. The “Sopranos” character Hersh Rabkin, played by Jerry Adler, was based on Levy. Although he has been dead for 20 years, Levy is still an inseparable part of James’ life.